In 2015-16, ABHE partnered with the Barna Group to assess perceptions of college-bound Christian students, their parents and others, seeking guidance for ABHE and its member institutions regarding college enrollment influences, attraction features, market positioning, strategy and messaging. The project officially concluded with the June 2017 publication of What’s Next for Biblical Higher Education?, a 60-page monograph and accompanying suite of video and web resources for member use in communicating to and engaging stakeholders relative to the research findings. Although a number of institutions have deeply engaged and profited from the research, nearly two years later, the potential for converting data analysis into concerted, actionable association-wide intelligence has not been fully and coherently leveraged. It would constitute scandalously poor stewardship to allow our investment to go under-exploited. The research findings make clear that we face not merely a complicated set of challenges, but a complex, even chaotic environment in which we must learn to attract and retain students and prepare graduates. Only adaptive change will suffice. We require Sons-of-Issachar insight. 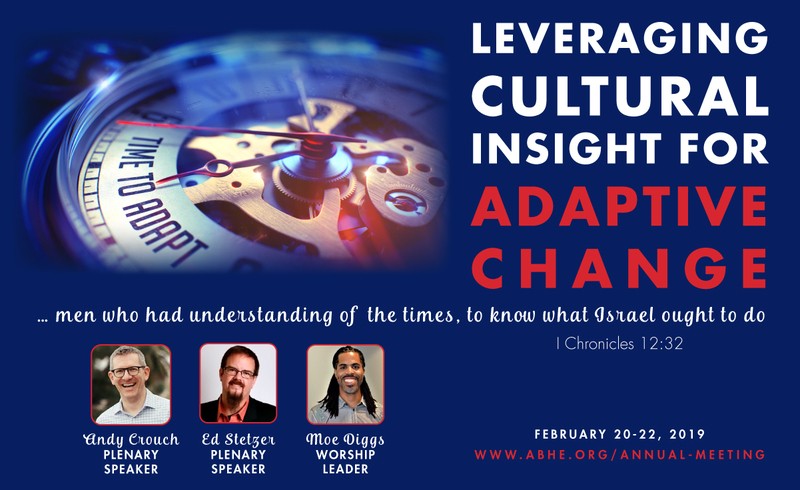 ABHE’s 2019 annual meeting will feature plenary speakers Andy Crouch and Ed Stetzer, each of whom has consistently demonstrated contemporary cultural insight in the spirit of the ancient Sons of Issachar. The meeting will also “crowd source” our member delegates, enlisting their most incisive and creative thinking to more fully realize the aims of biblical higher education market positioning, strategy and messaging. You won’t want to miss the Celebration Banquet featuring Stephen & Juliette Trafton of Living Letters, who will be doing a dramatic scriptural recitation. Stephen Trafton’s Broadway credits include Les Misérables (Original Revival Cast) and the National Tour of The Phantom of the Opera. 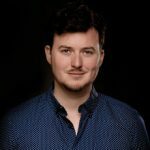 He has performed at many regional theatres across the country playing leading roles in shows such as Oklahoma!, Joseph and the Amazing Technicolor Dreamcoat, Bye Bye Birdie, Love’s Labour’s Lost, Romeo & Juliet, Beauty and the Beast, and many others. He received his training at Baldwin-Wallace College in Berea, OH. He is the West Side Youth Director at Redeemer Presbyterian Church in NYC, where he served under the leadership of the recently retired Dr. Tim Keller. Previously, he worked with Max McLean at Fellowship for the Performing Arts. He performs Living Letters (Philippians, Ephesians, Colossians, Jonah, and Acts 13) at venues across the country. Currently, he lives in Astoria, NY, with his wife, Juliette, and their two children. Juliette Trafton recently starred as Luisa in the longest running musical in the world, The Fantasticks, directed by Tom Jones Off-Broadway in NYC. Before that, she performed the role of Christine Daae in the National Tour of The Phantom of the Operaand, regionally, in leading and featured roles in Guys and Dolls, Into the Woods, Jane Eyre, Peter Pan, and Kiss Me, Kate. 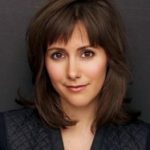 You can follow her work as a voice-over artist on Audible.com and her commercial work on national television. She loves nothing more than performing with her husband, Stephen. Their finest productions yet are their two little ones, Tadd and Audra.